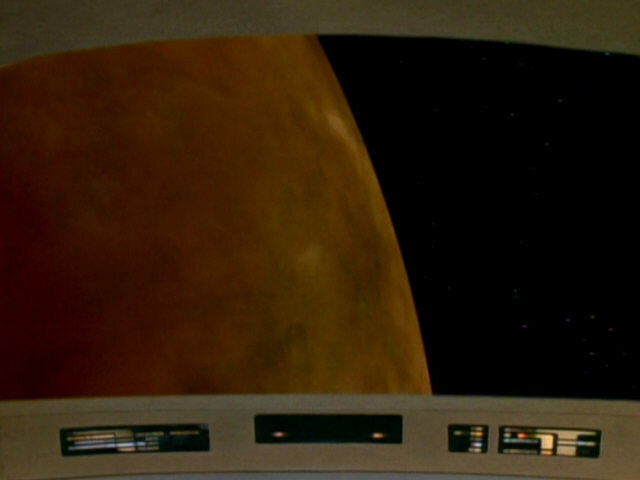 Ex Astris Scientia - Observations in TNG: "True Q"
Observations in TNG: "True Q"
Here are some observations about sets, props and visual effects in TNG: "True Q" without a specific theme, and a comparison of the original TV release (TNG) with the remastered episode (TNG-R). 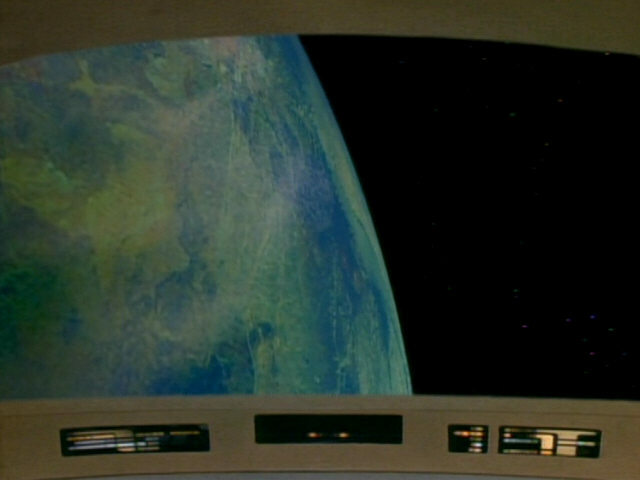 The Starbase 112 planet is only seen in this scene. 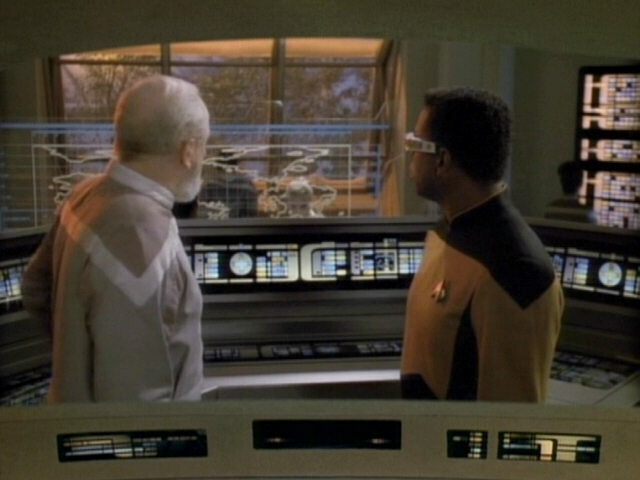 The footage was originally created for "The Icarus Factor" (as Starbase Montgomery) and has appeared as countless other planets on TNG. 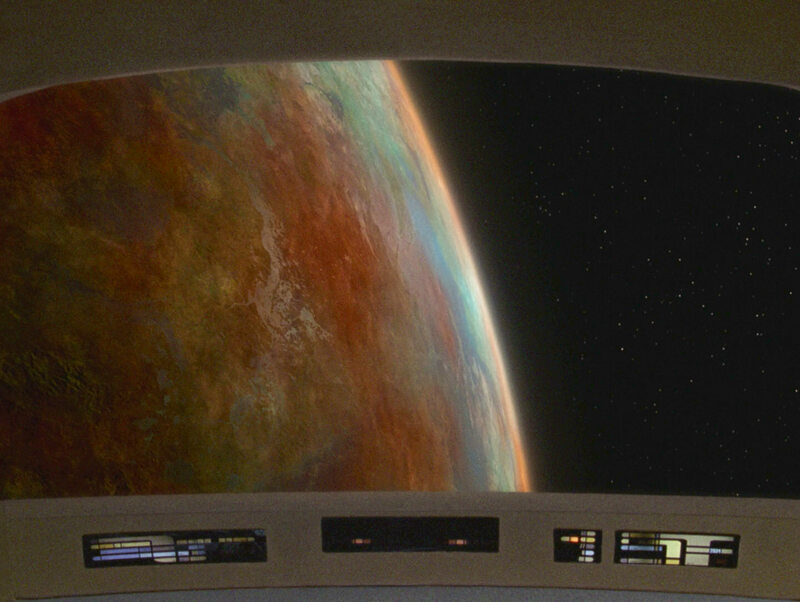 A new planet was created for TNG-R. 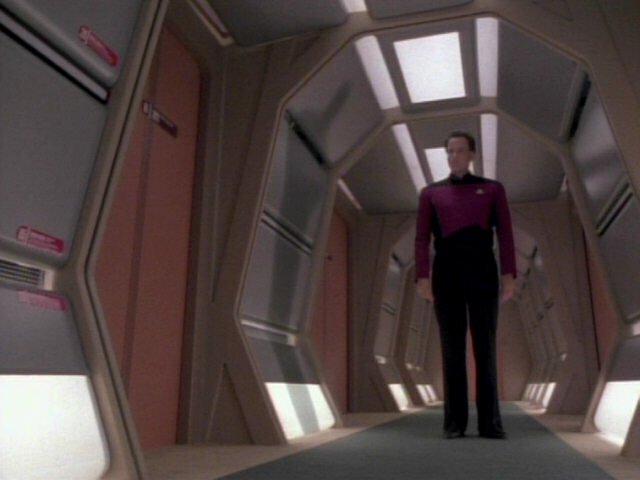 This is one of several shots of the ready room seen in this episode that allow a good look at the set. 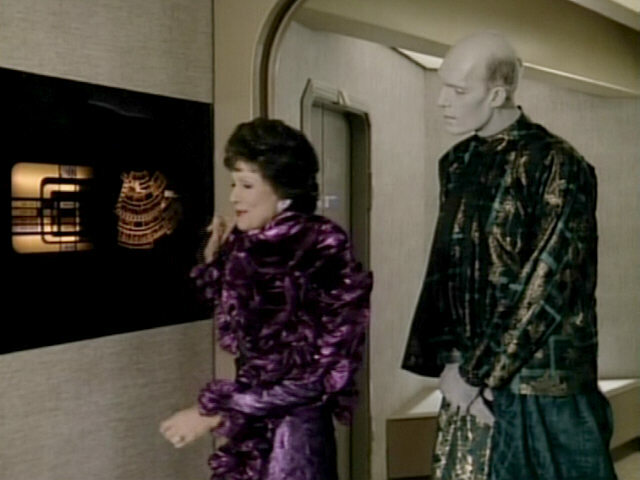 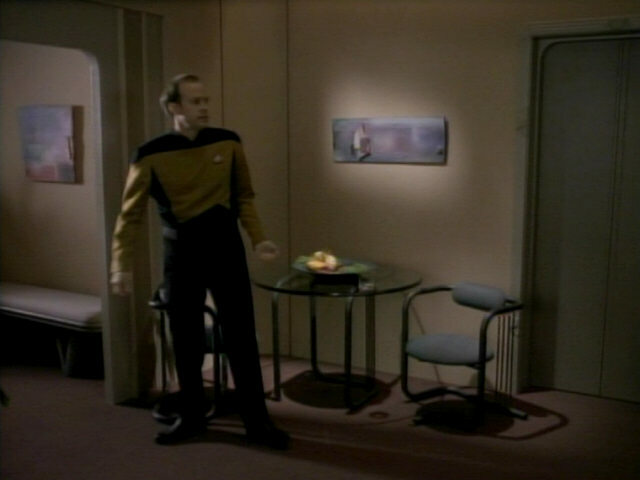 Here, the alcove with Picard's replicator can be seen very well. 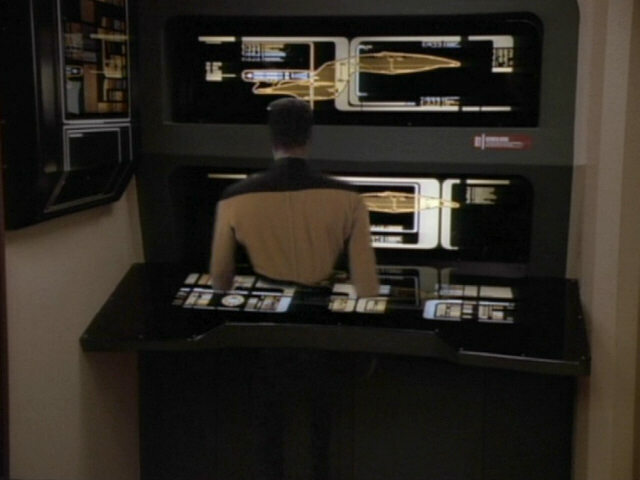 This part of the set in HD. 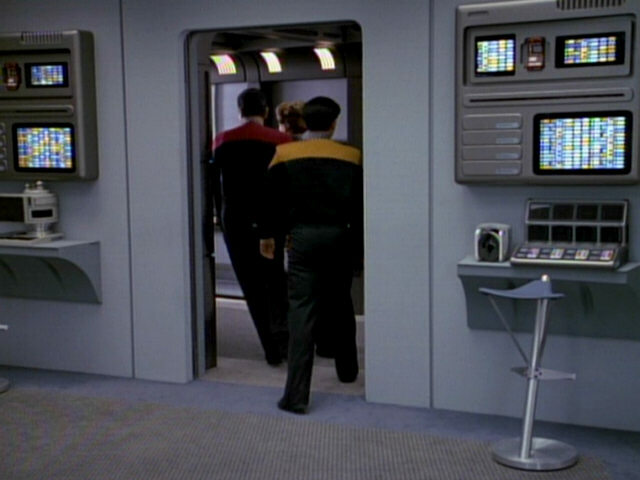 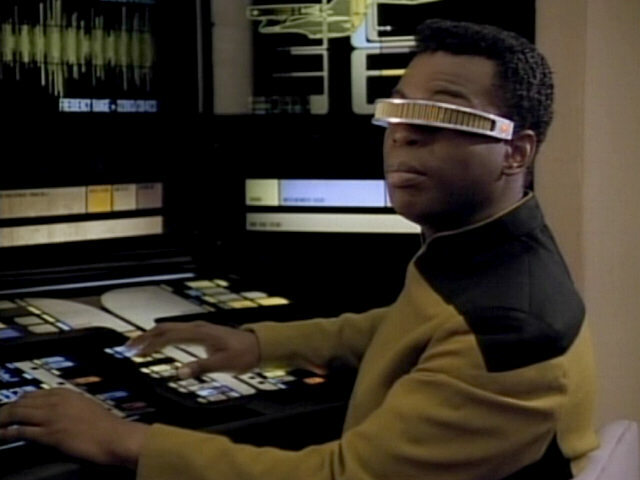 Crew members used the LCARS interfaces built into the corridor walls in several earlier episodes, including "Encounter at Farpoint", "11001001", "Hide and Q", "Manhunt" and "Transfigurations". 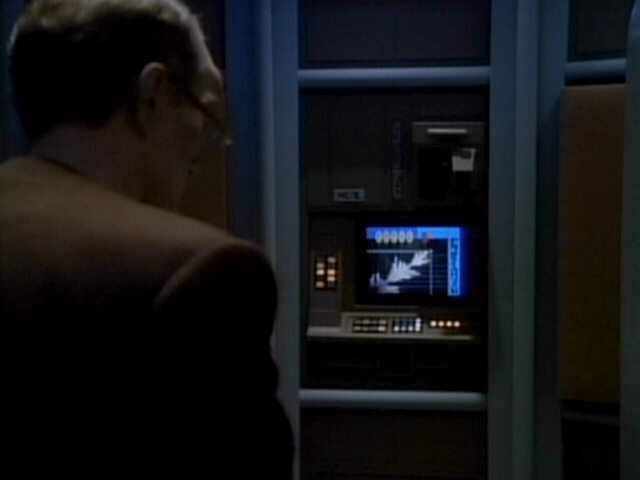 "Manhunt" In HD, it can be seen that the display features the number 40272, so the original graphic was most likely created during the second season. 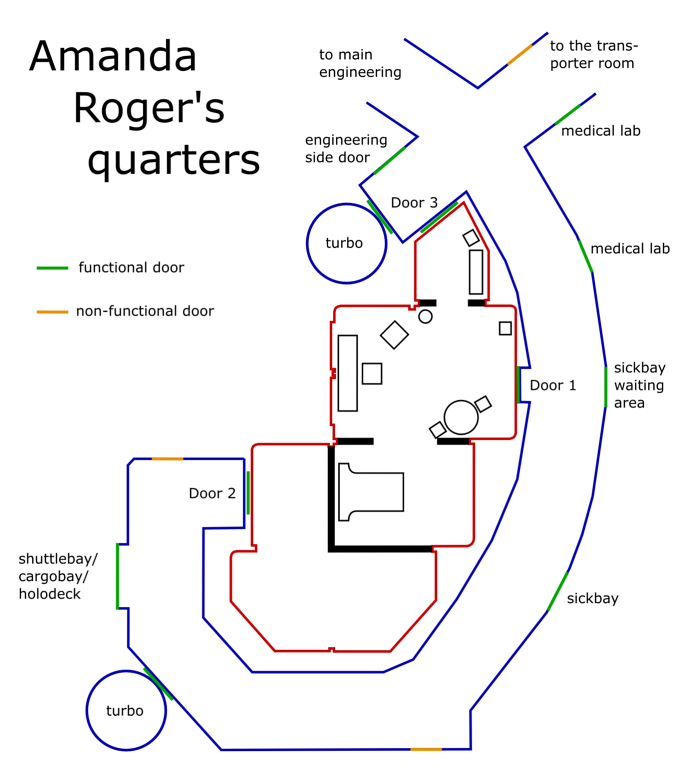 The door label to Amanda Roger's guest quarters can briefly be seen in this shot. 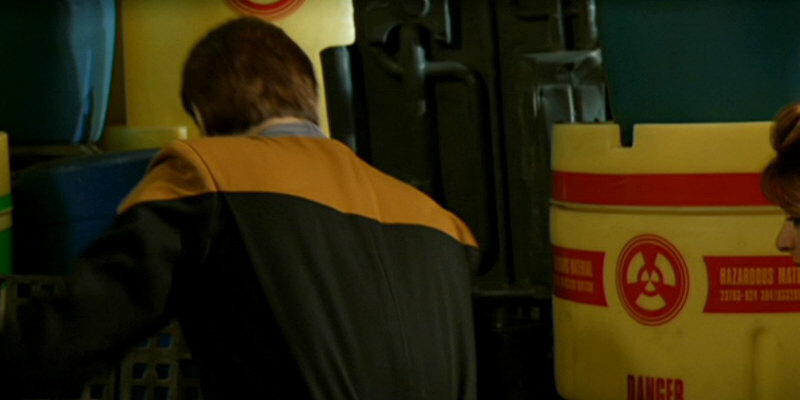 The label is clearly brown. 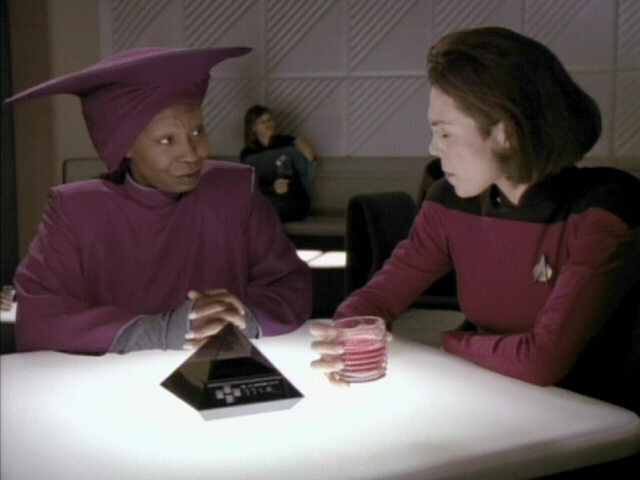 When Q later visits Amanda in her quarters, the label is purple, all of a sudden. 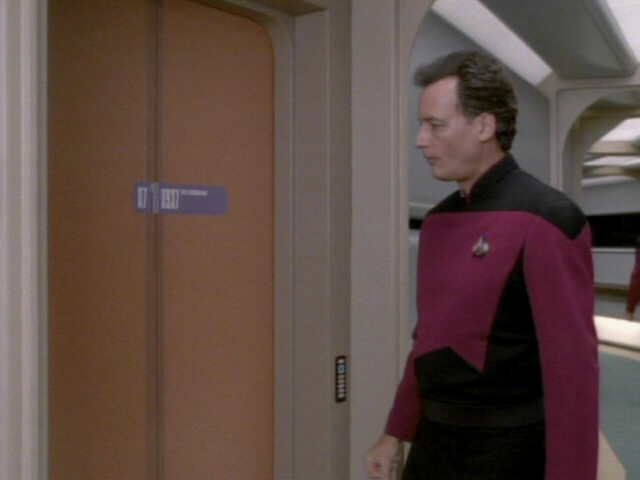 the episode The door label still changes its color in TNG-R.
Amanda Roger's quarters are a redress of the junior officers' quarters. 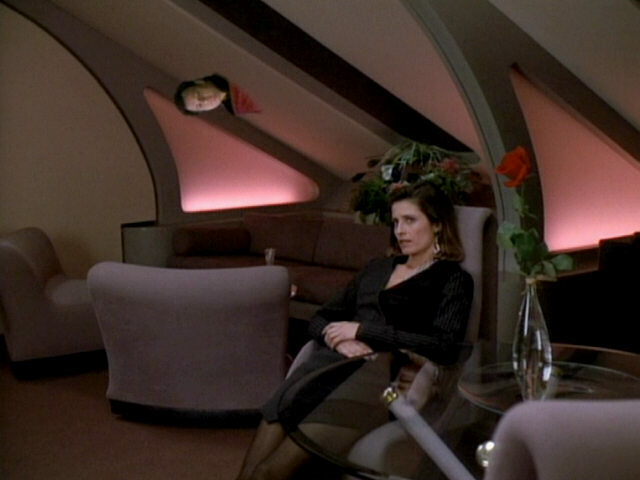 The second room with her bed is only seen in a deleted scene from the episode. 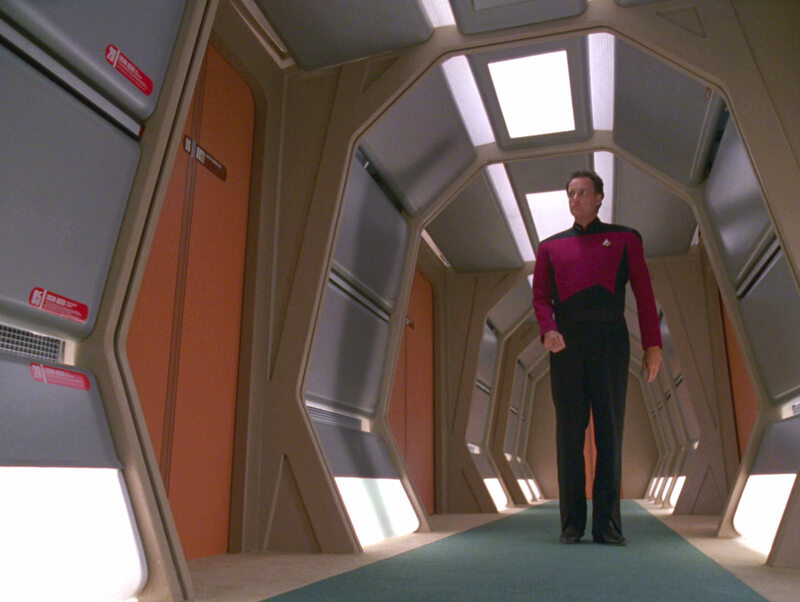 quarters The room in HD. 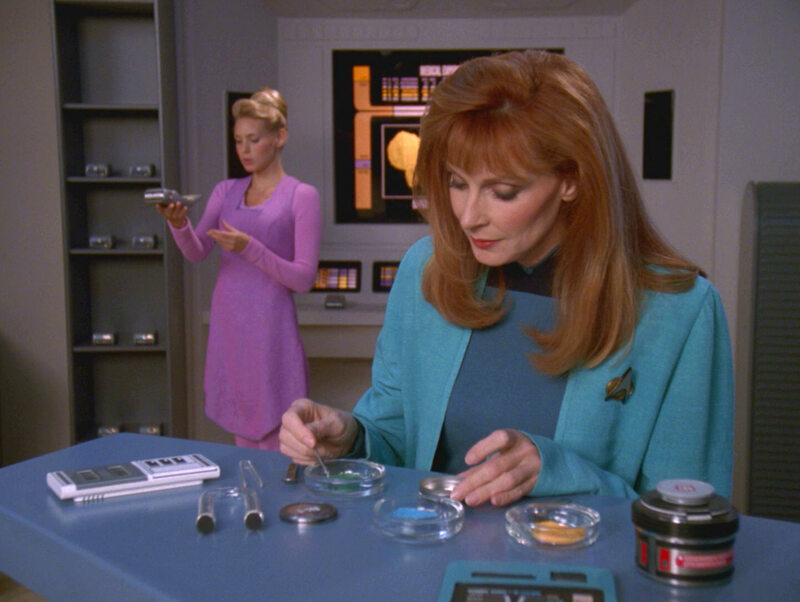 Amanda checks the functionality of several tricorders in this scene. 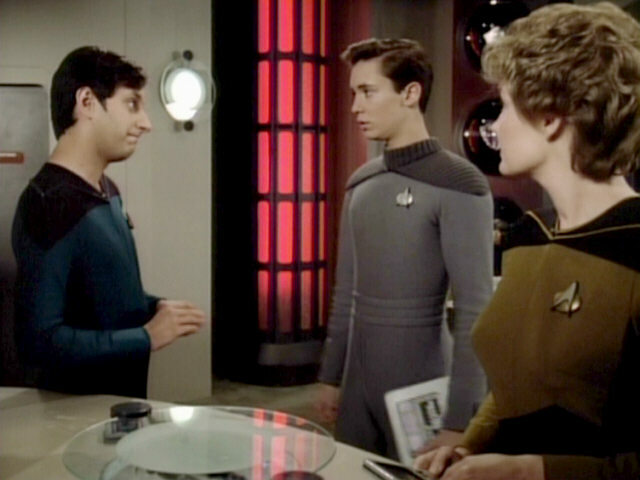 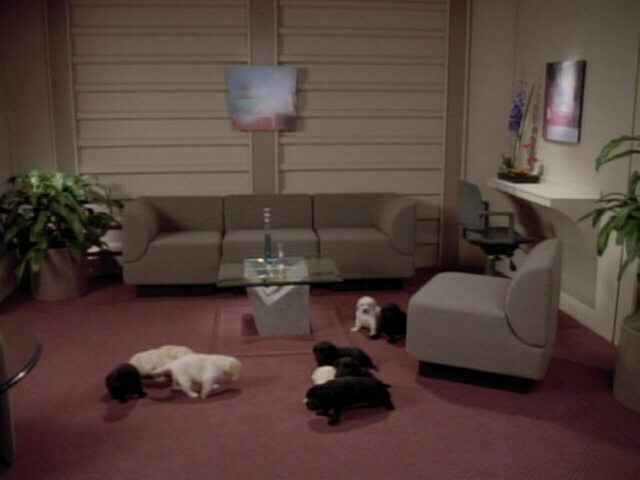 In this scene, two medical tricorders, four tricorders introduced at the beginning of season 5 and two older tricorders, introduced at the beginning of season 3, are seen. 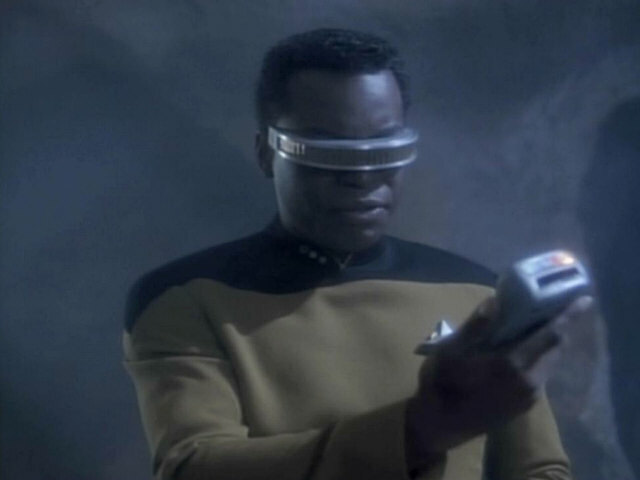 As can be seen, the season 3 tricorders still feature the small detachable scanners, the season 5 tricorders don't. 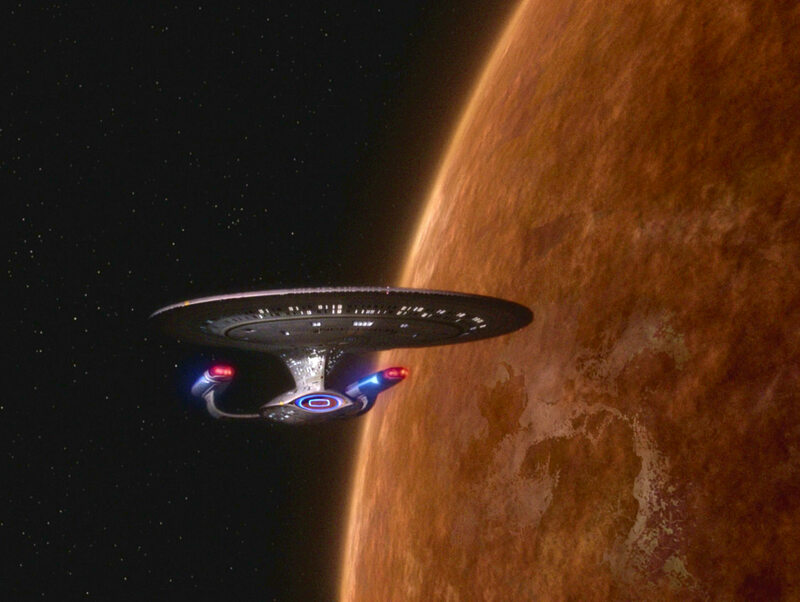 Imperfect" The props in HD. 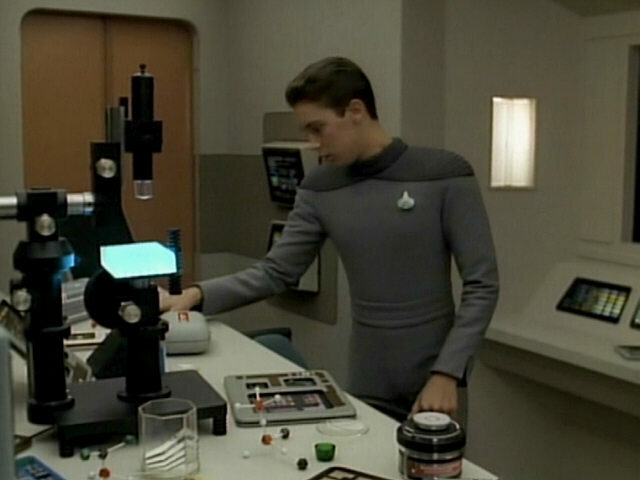 The scenes set in the medical lab feature two props last seen in "Evolution". 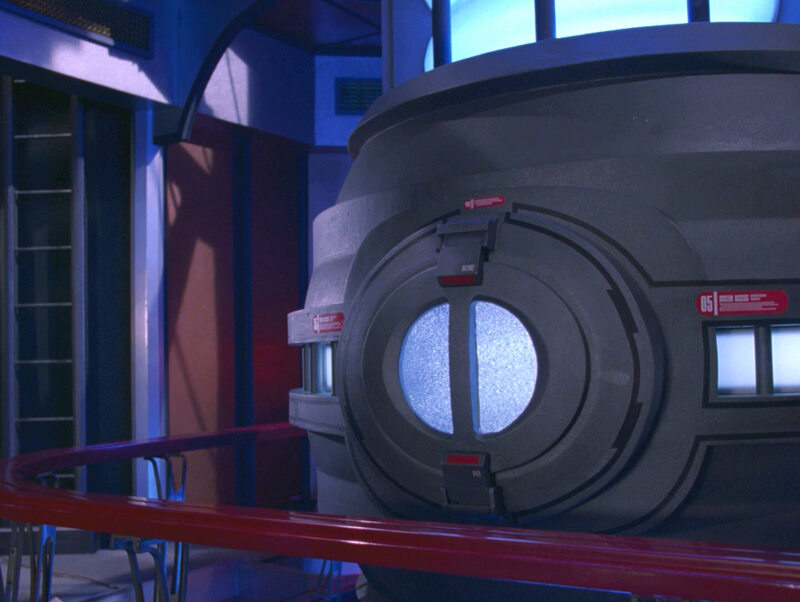 One is the small round box in the foreground which Wesley also used when he experimented with nanites in season 3. 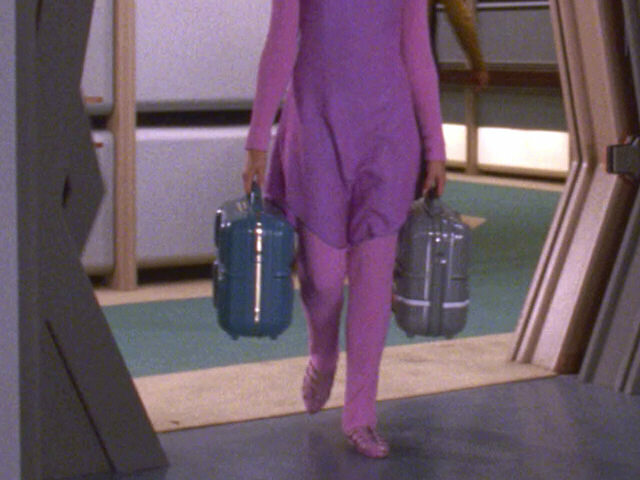 Amanda Roger carries two cases that have appeared in some earlier episodes. 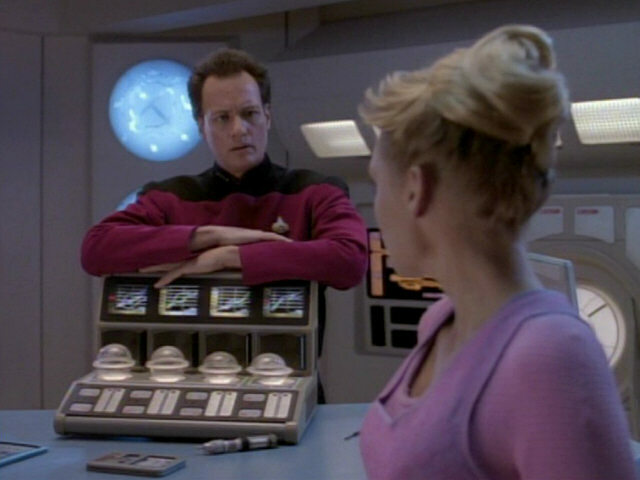 The gray case was prominently used by Dalen Quaice in "Remember Me", while the blue case will be used by Crusher in "Suspicions". 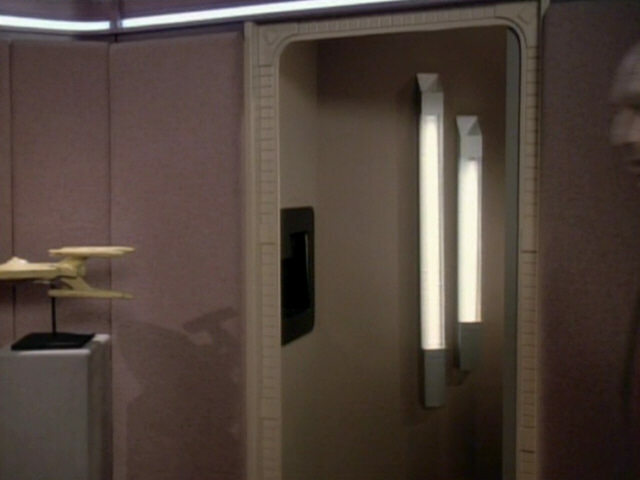 Only in this episode, the aft section of the type 15 shuttlepod and the cockpit are not separated by a wall, like in all earlier appearances, like "The Most Toys" and "The Mind's Eye". 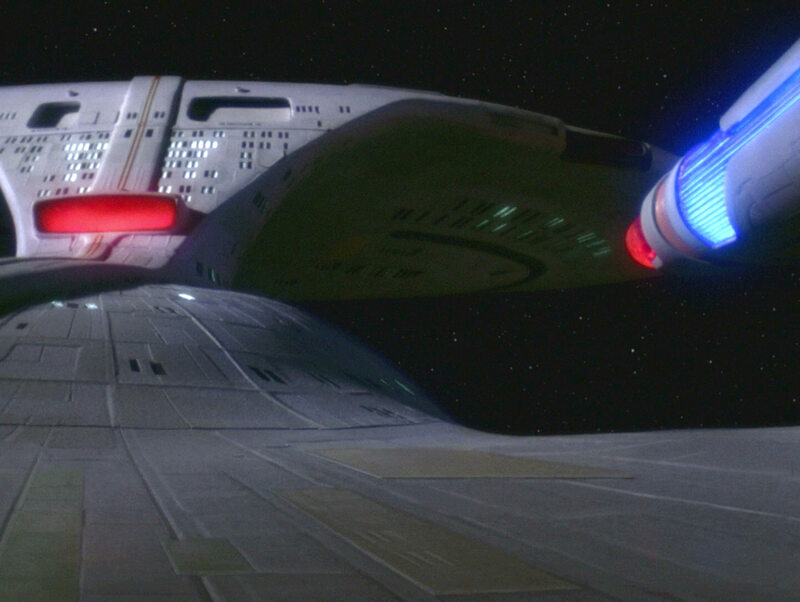 "The Mind's Eye" The shuttle aft hatch in HD. 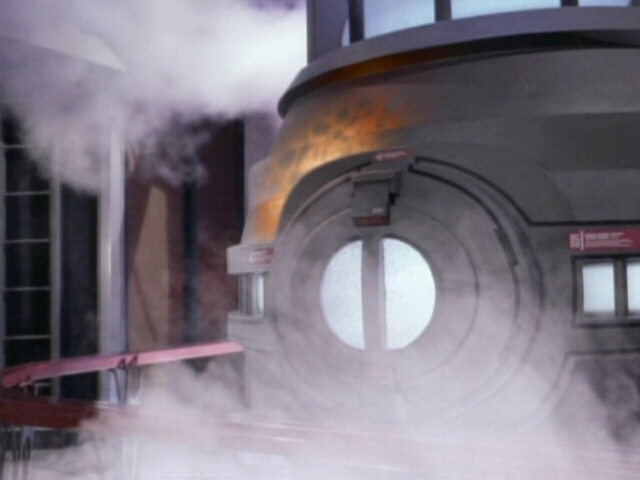 A rupture in the warp core nearly destroys the USS Enterprise-D. A comparison still from season 5 shows that this part of the set was not modified between seasons. 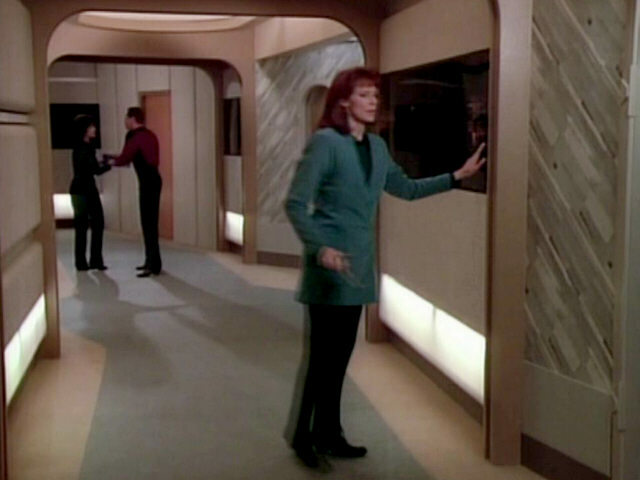 "Cost of Living" The effect was redone for TNG-R.
Q walks through a wall to quickly get to Amanda Rogers. 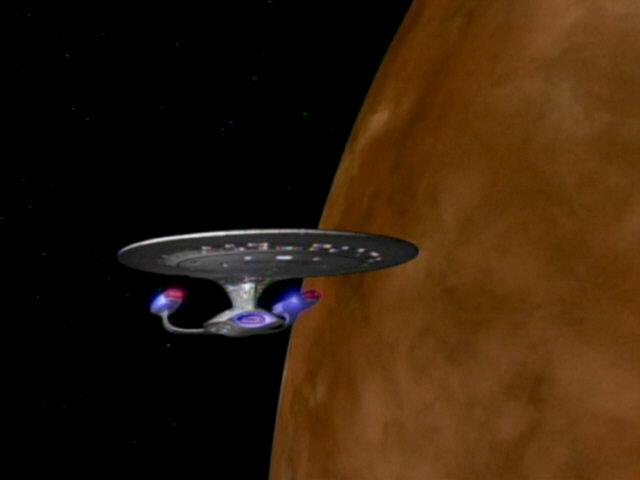 A similar effect was used a few episodes earlier in "The Next Phase". 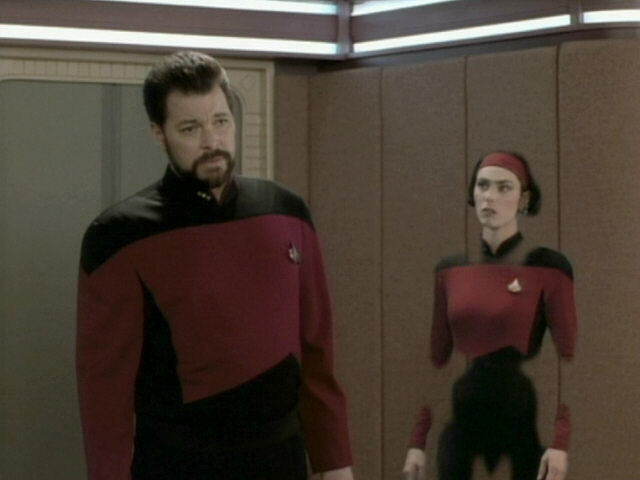 Phase" The reconstructed effect for TNG-R.
Another member of the Q Continuum appears as a shadow on a corridor wall. 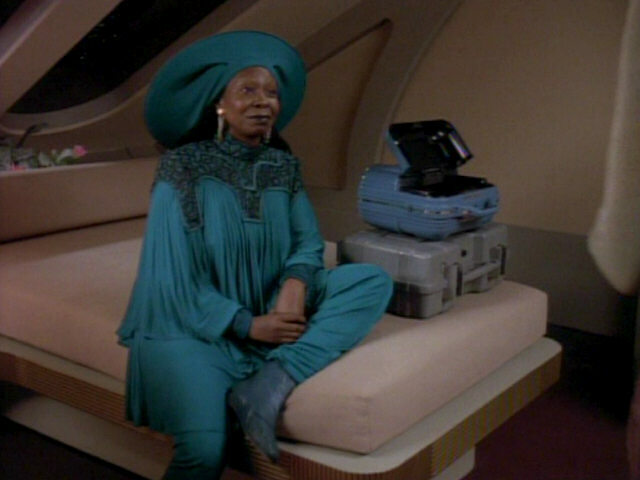 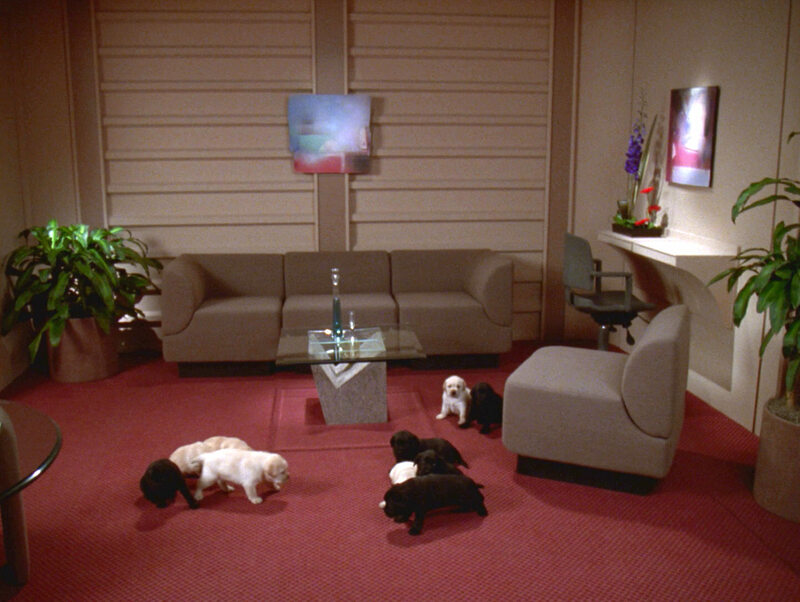 The effect in TNG-R.
Another look at Amanda Roger's guest quarters. 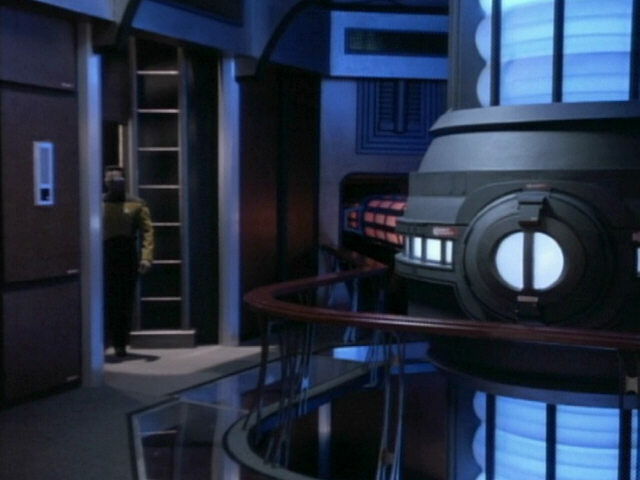 This part of the set was last seen in "Realm of Fear" as Barclay's quarters. 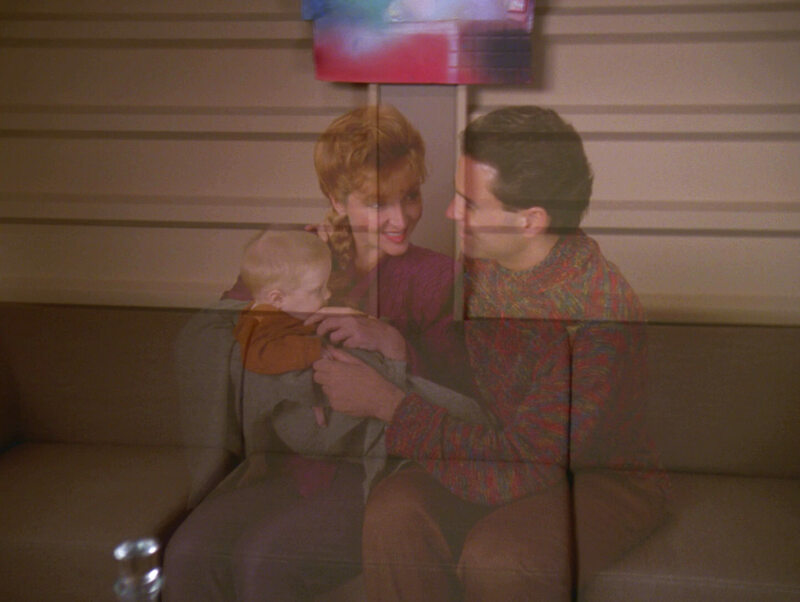 Amanda Roger's parents appear as ghostly figures. 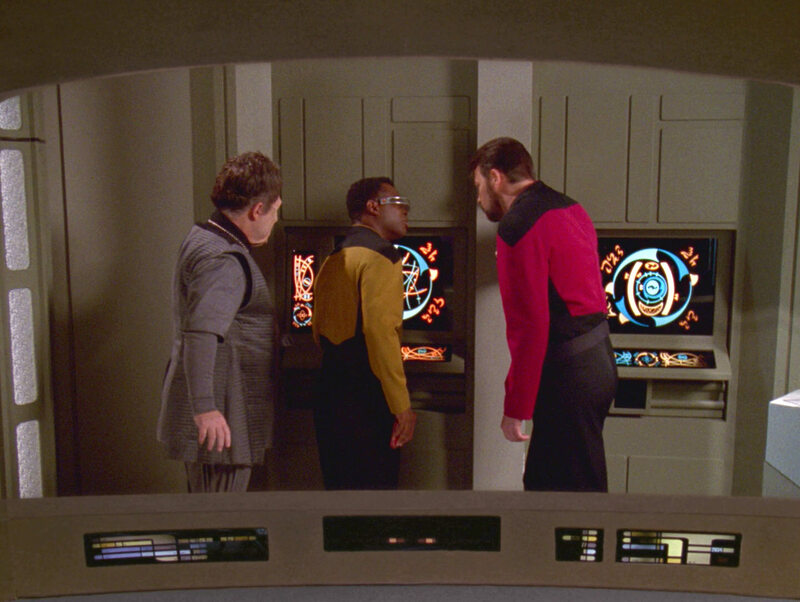 The effect in TNG-R.
Another prop first seen in "Evolution" appears here. 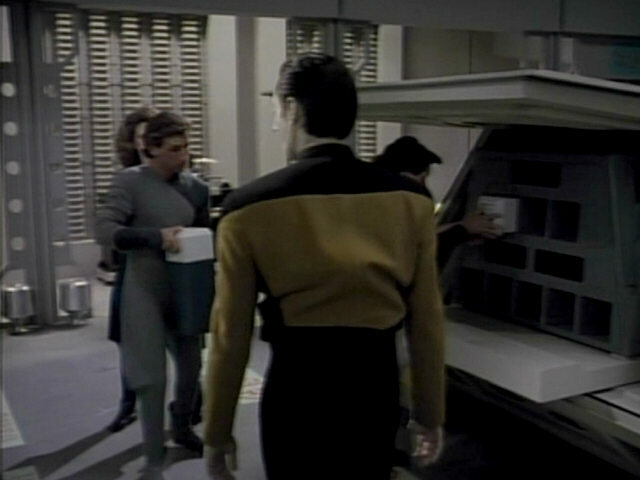 The small gray box with numbers was originally used by Wesley Crusher in that episode. 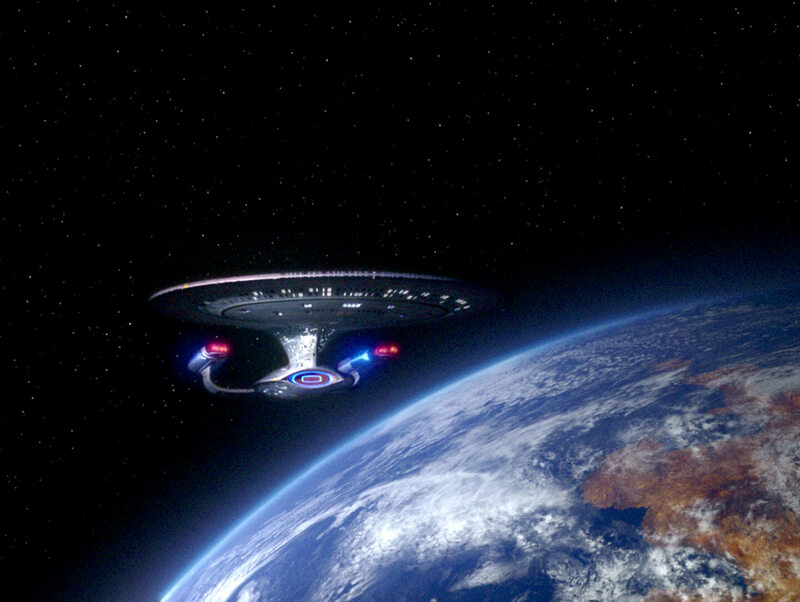 "Evolution" HD The prop in HD. 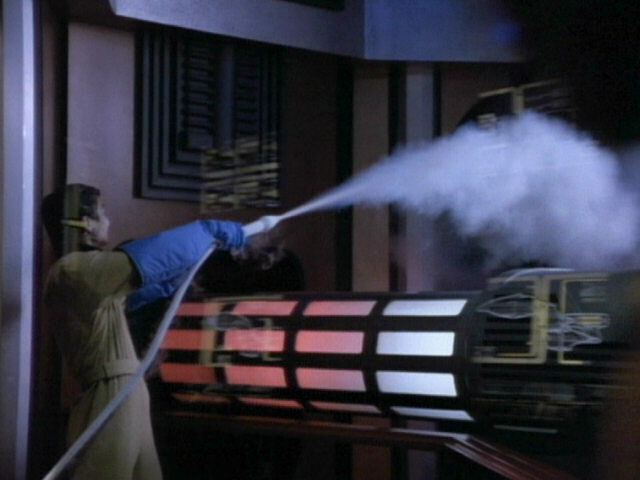 Similar long tubes, like the one seen in the background in the lab on Tagra IV, were also seen in the geological lab in "Pen Pals" and are seen behind the warp core in main engineering. 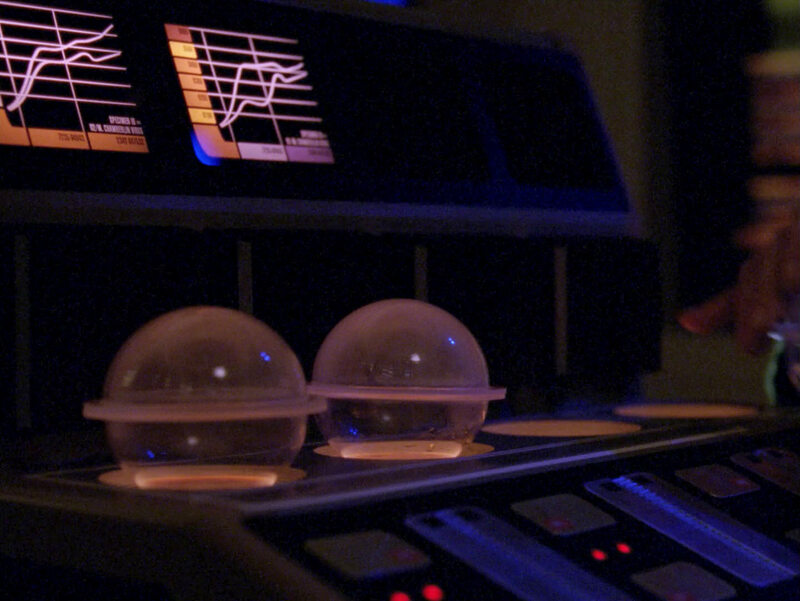 "Cost of Living" The tubes in HD. 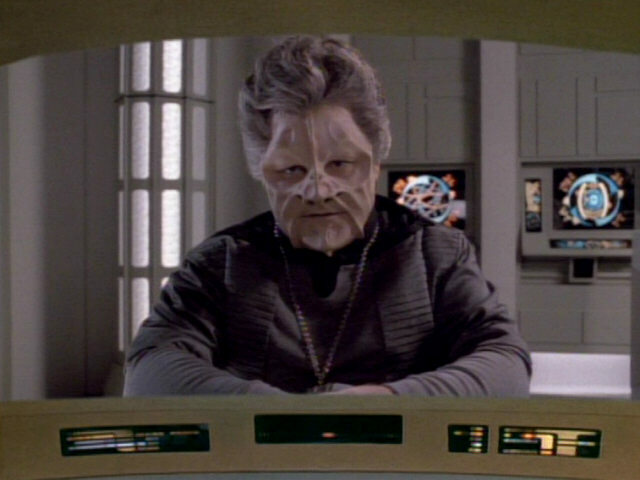 Also a good look at the Tagran make-up. 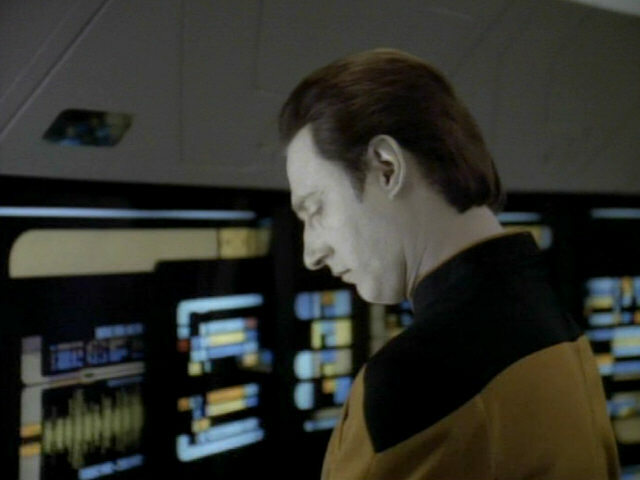 The graphic to the left of Data is still in place from the previous episode, "Schisms". 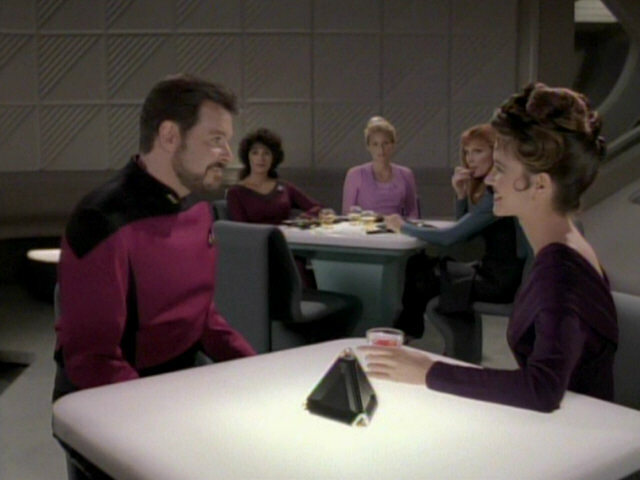 It was originally created for "Ménage à Troi", however. 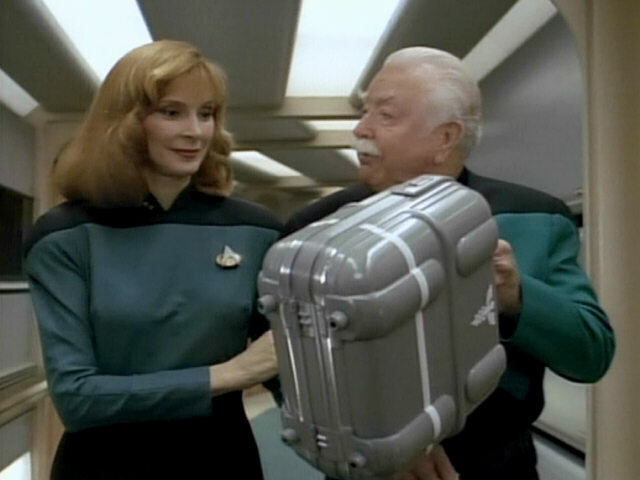 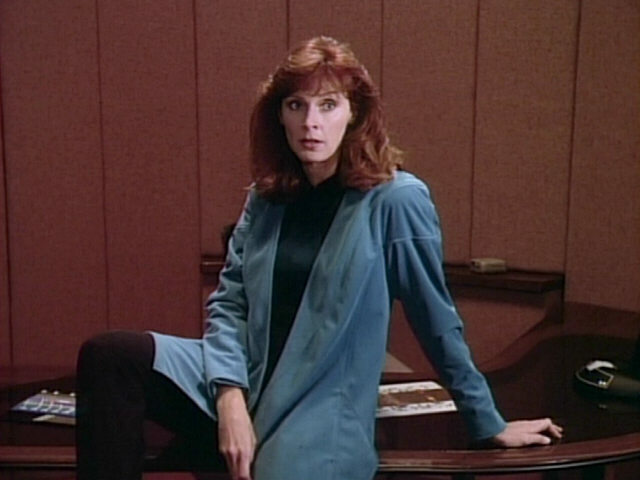 The medical device Q leans on was originally used by Doctor Crusher to grow samples of Diomedian scarlet moss in "Clues". 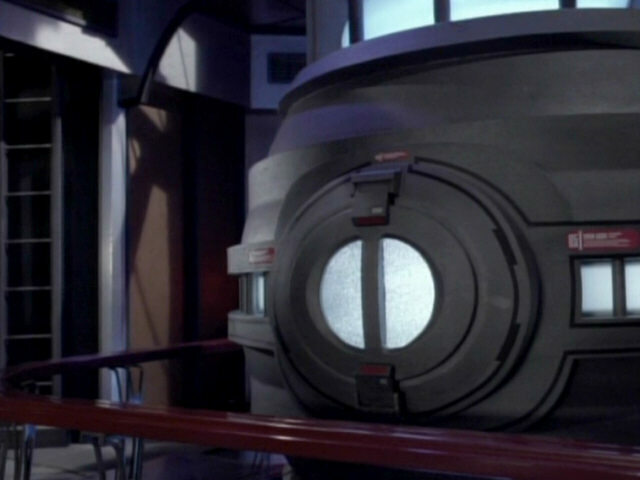 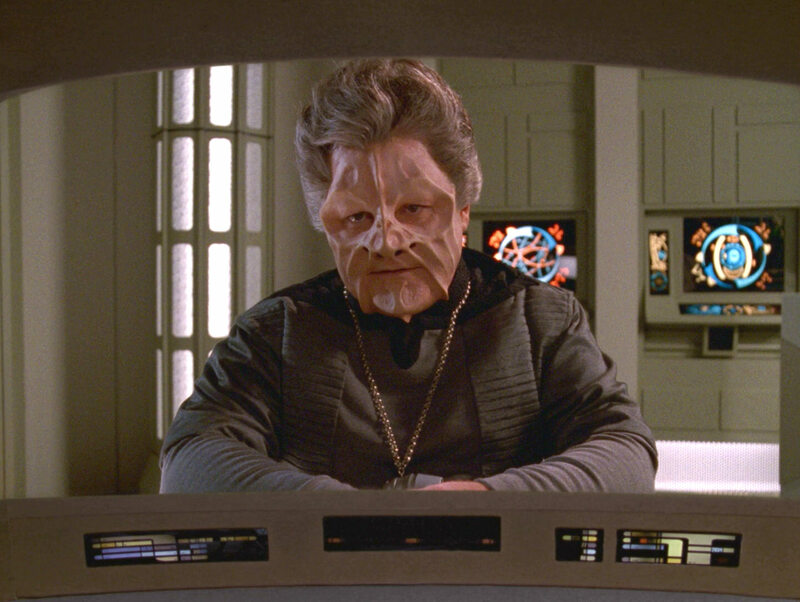 It is later seen in the background in several Voyager episodes in Voyager's sickbay. 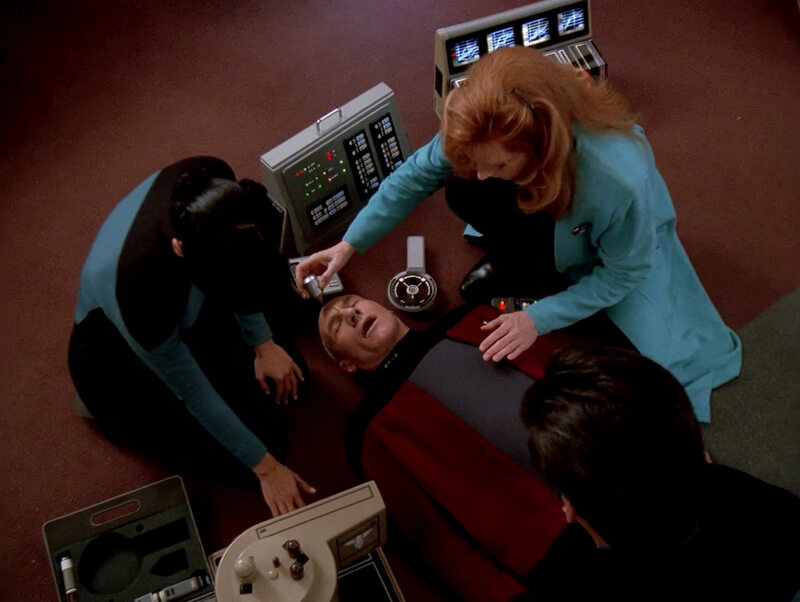 It was also used as a portable medical device in "The Inner Light". 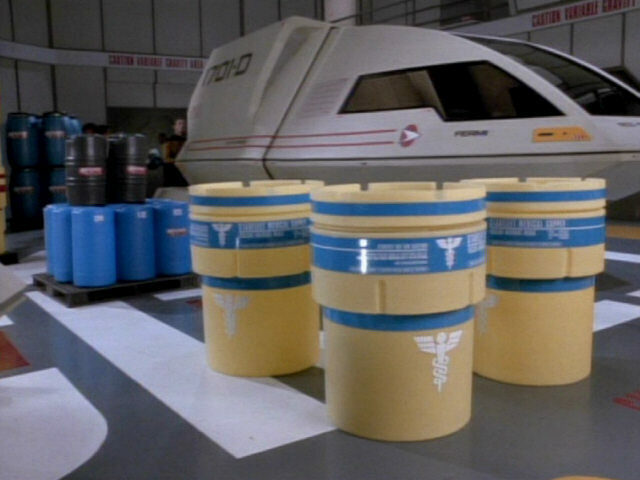 VOY: "Phage" The props in HD. 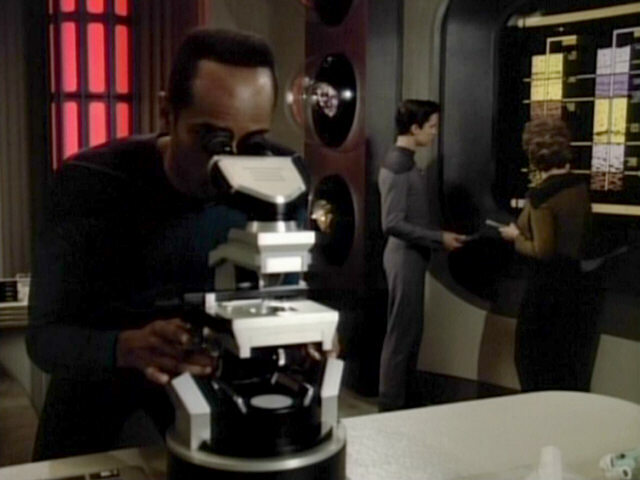 The microscope behind Amanda Rogers was last seen in the season 2 episode "Pen Pals" in the geological lab. 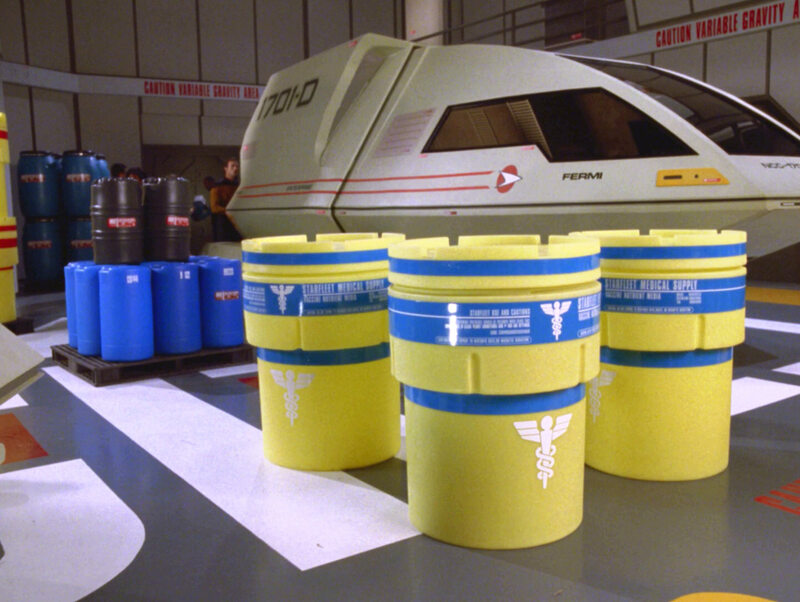 The yellow cargo containers were originally created for "Disaster". 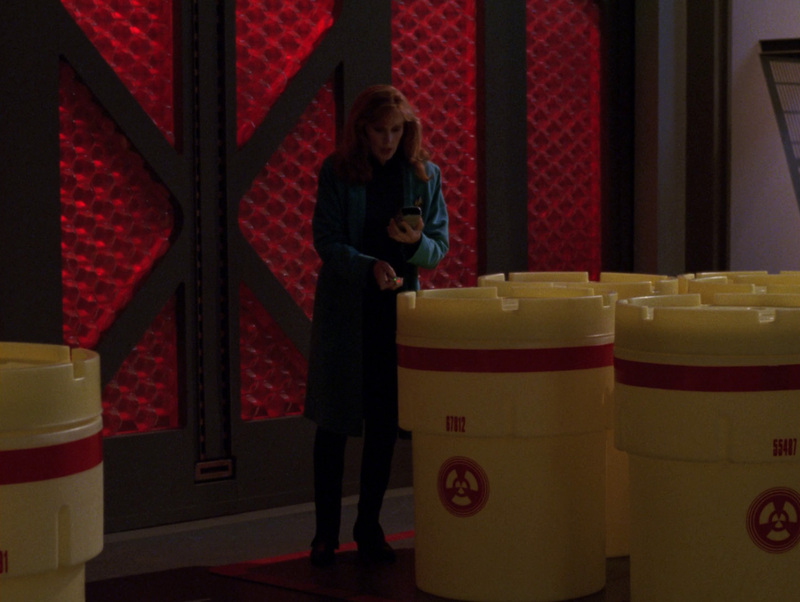 That episode only featured containers with red labels, though. 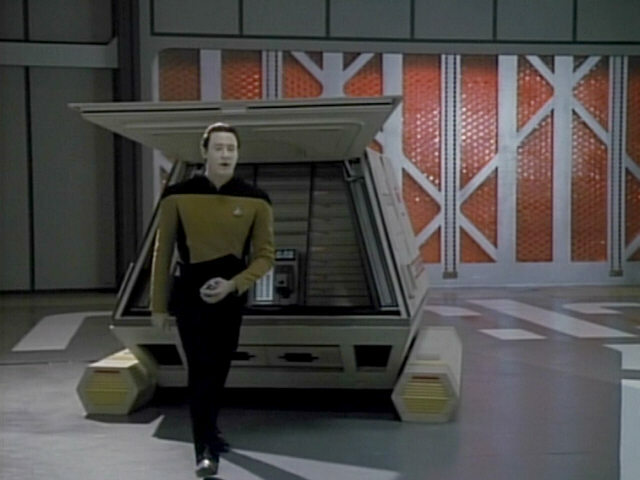 In "Generations" containers with green labels also appear. 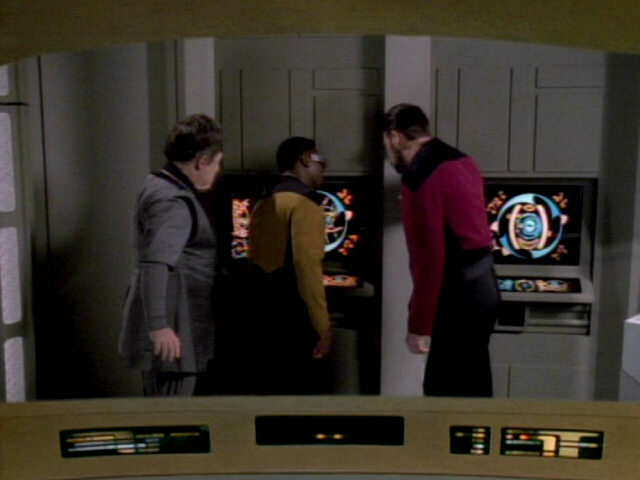 Q sticks his head through the hatch of the dilithium chamber. 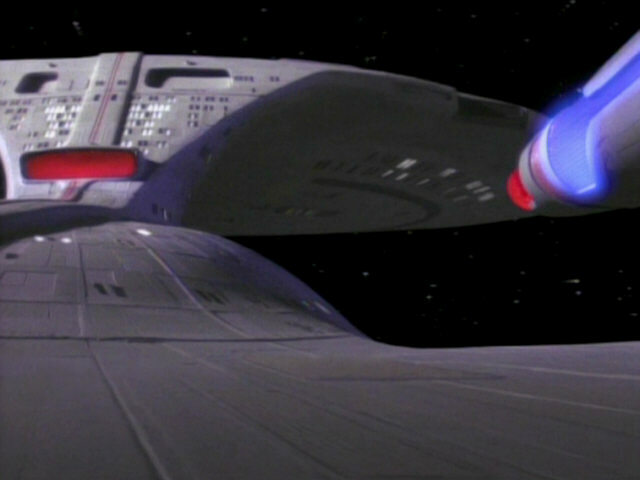 He last poked his head through the outer hull in "Qpid". 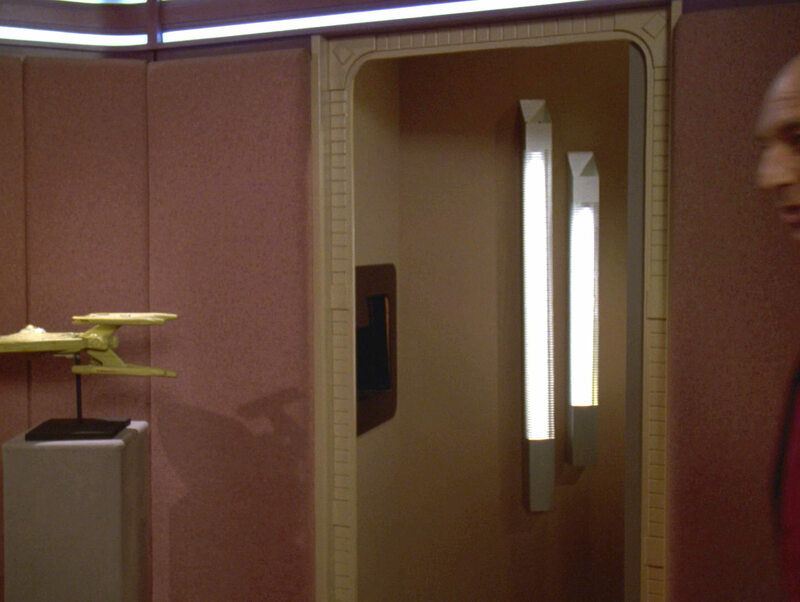 "Qpid" The effect in TNG-R.
Q and Amanda Rogers stand on the hull of the USS Enterprise-D in this spectacular shot. 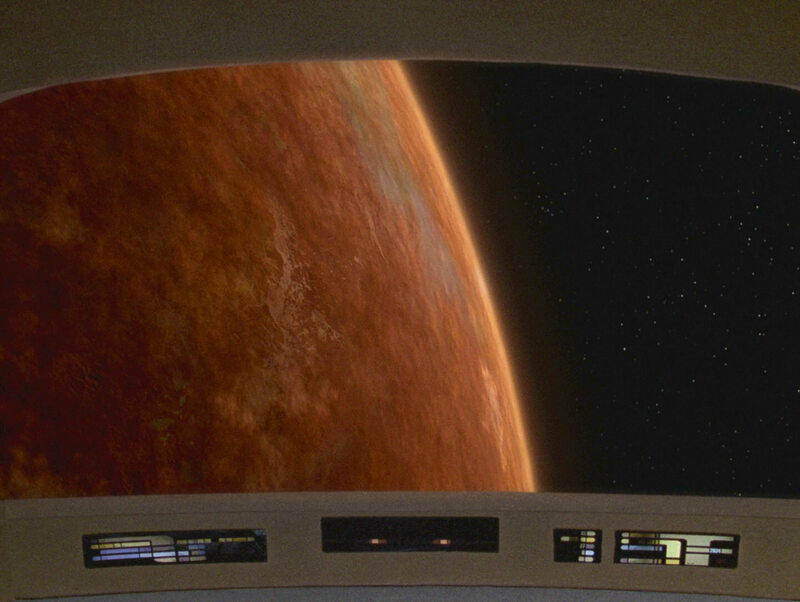 The spectacular shot in HD. 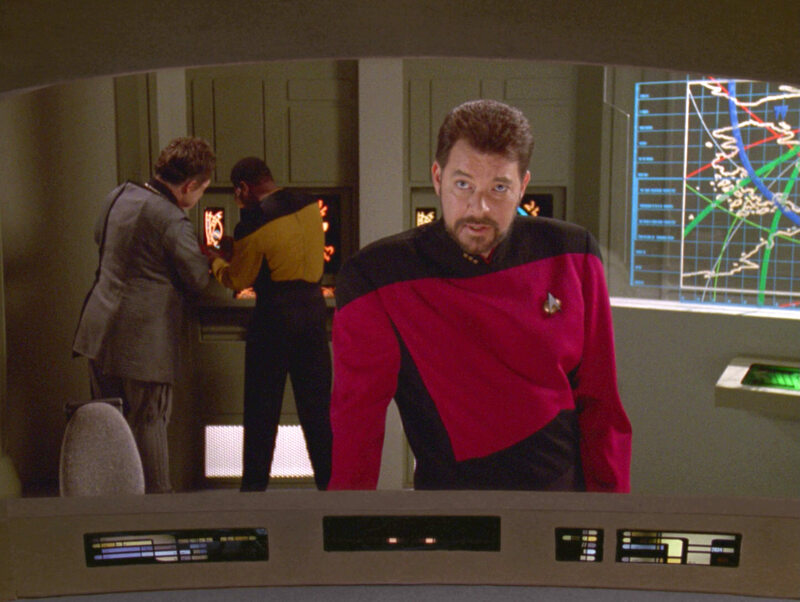 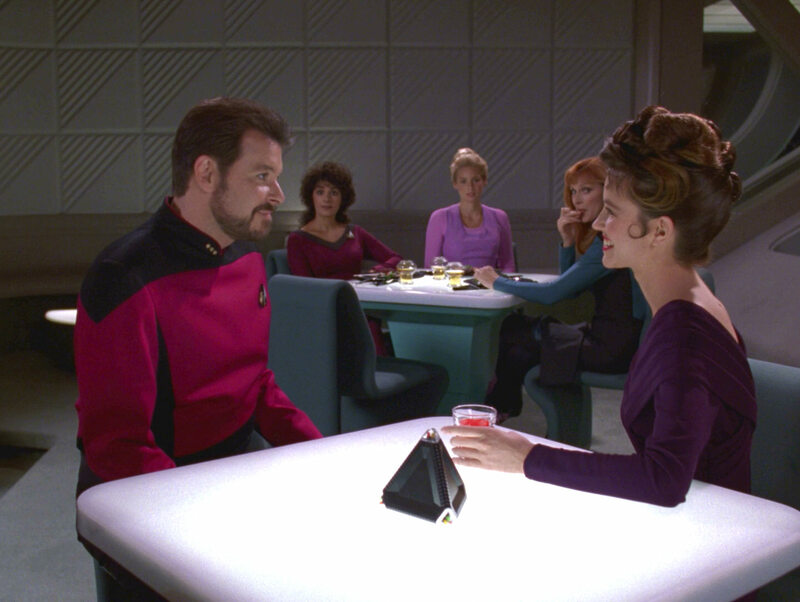 The small black pyramid on Riker's Ten Forward table is different from the pyramids normally seen in Ten Forward. 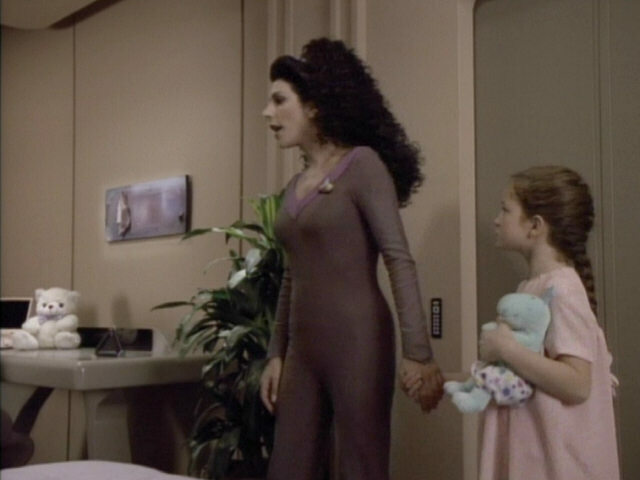 The same toy was also seen in Clara Sutter's bedroom in "Imaginary Friend". 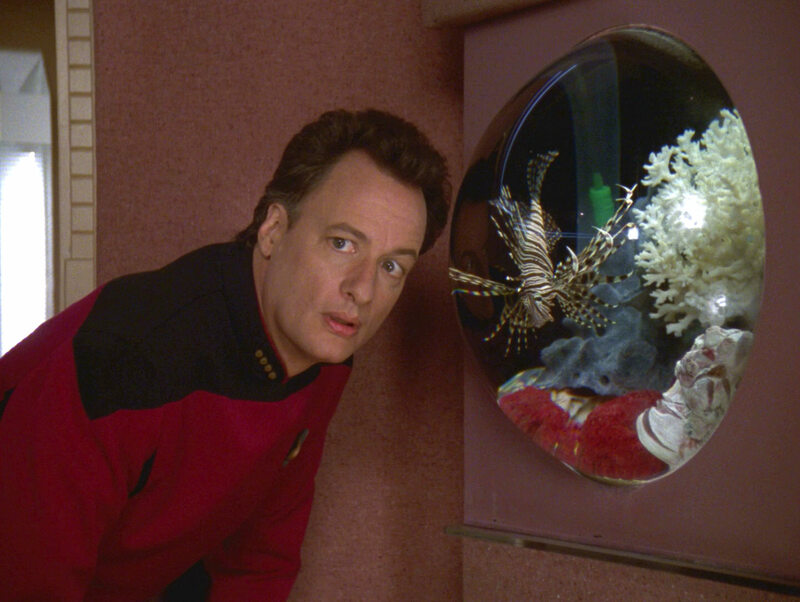 Friend" A good look at the prop in HD. 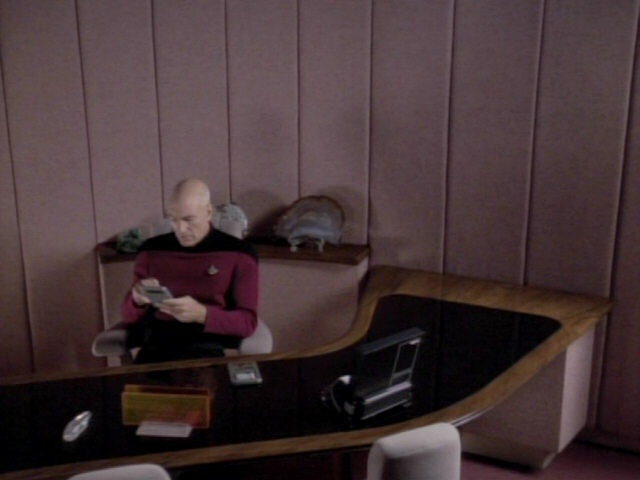 This part of Picard's ready room desk is rarely seen. 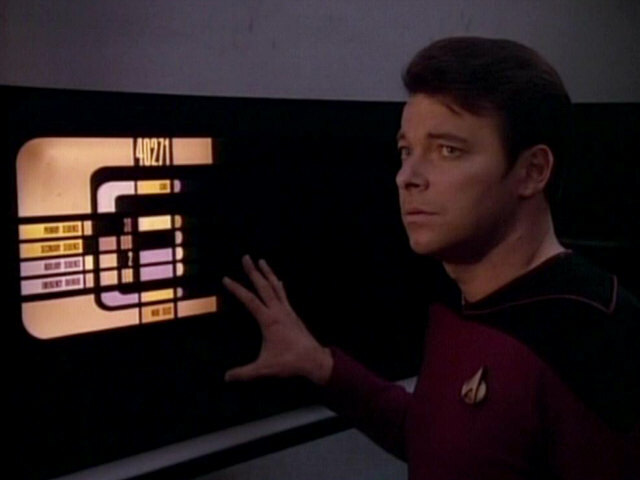 It also prominently appeared in a memorable scene from season 1's "The Naked Now". 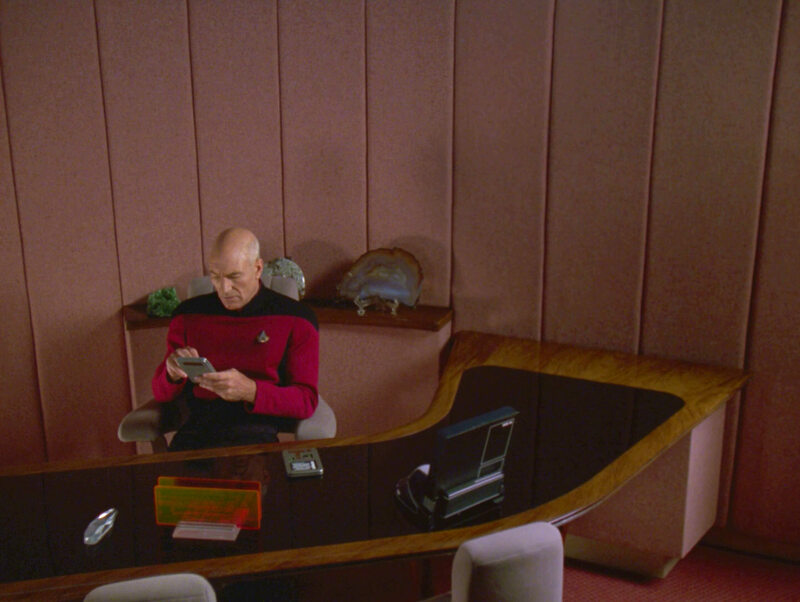 "The Naked Now" Picard's desk in HD. 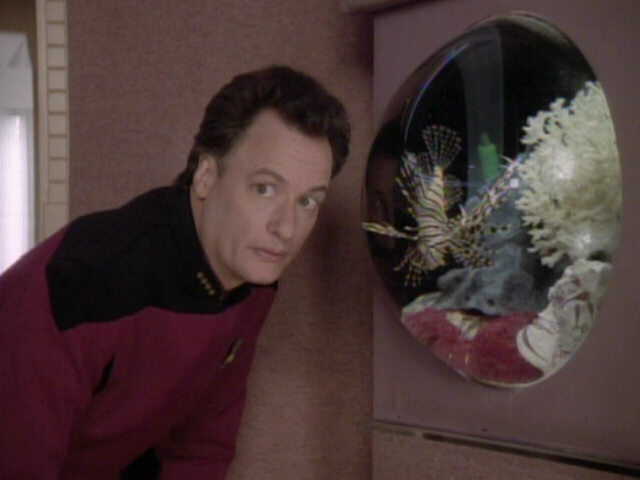 Picard's fish Livingston was last seen up close in the late season 5 episode "I, Borg". 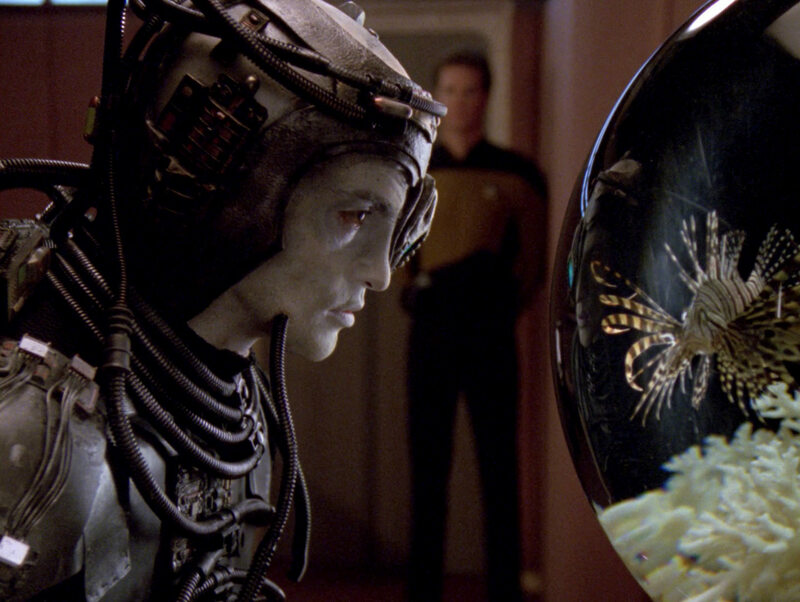 "I, Borg" HD Livingston in HD. 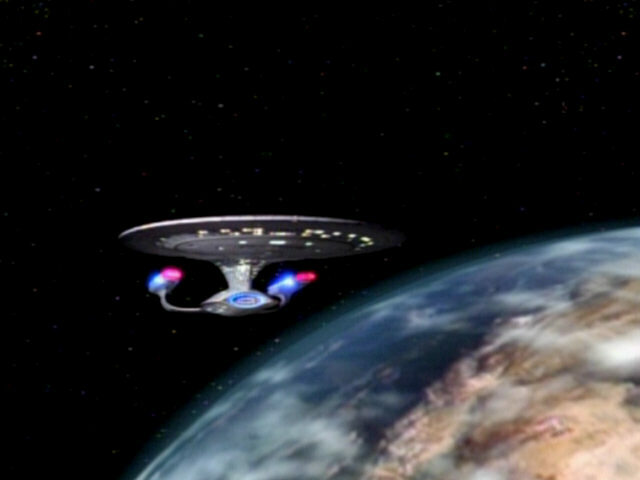 The USS Enterprise-D in orbit of heavily polluted Tagra IV. 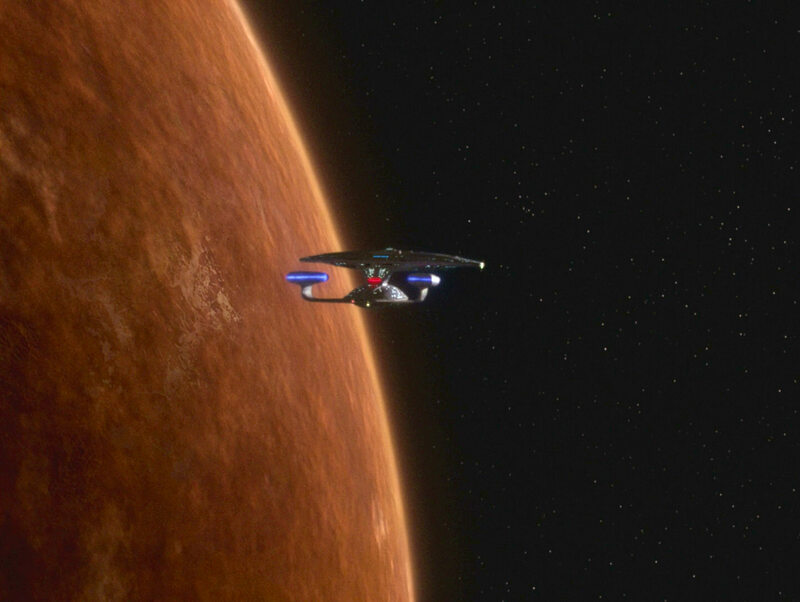 The footage will be reused later this season as the ravaged Indri VIII in "The Chase". 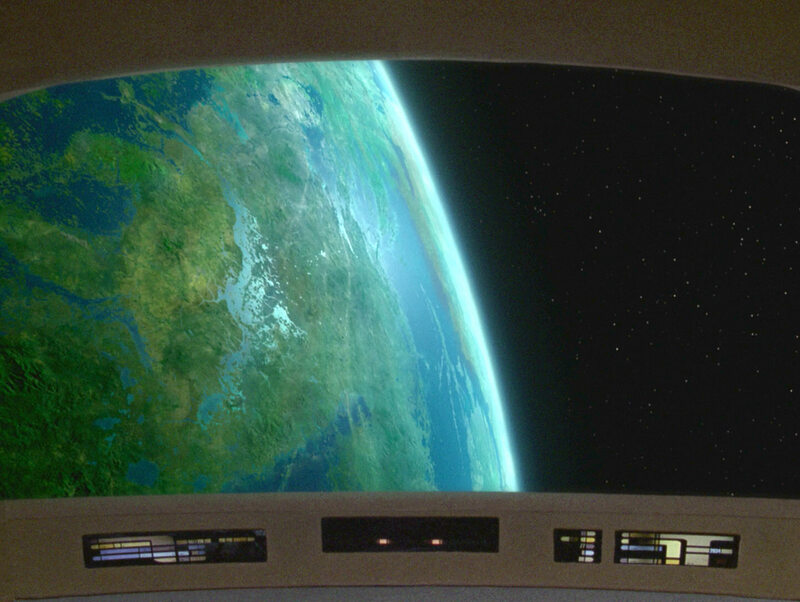 The planet was redone for TNG-R. 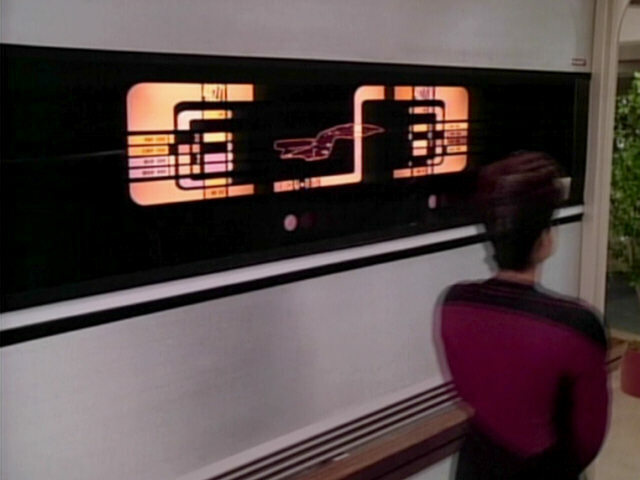 The glass graphic seen in the lab on Tagra IV was last seen in the season 5 episode "A Matter of Time" in the lab on Penthara IV. 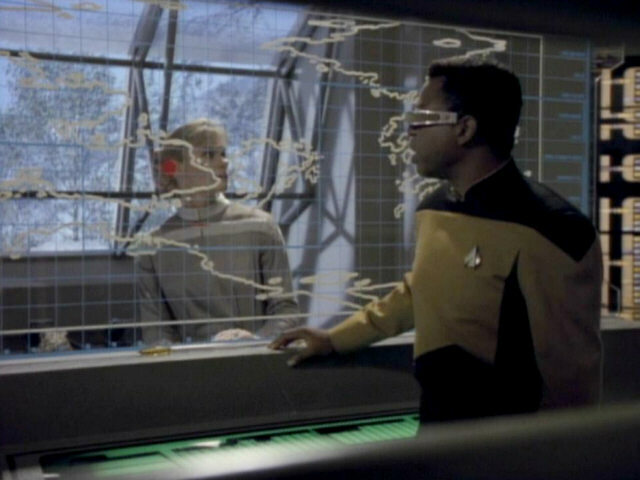 Although the graphic was modified slightly, the outlines of the continents on the planet(s) are still the same. 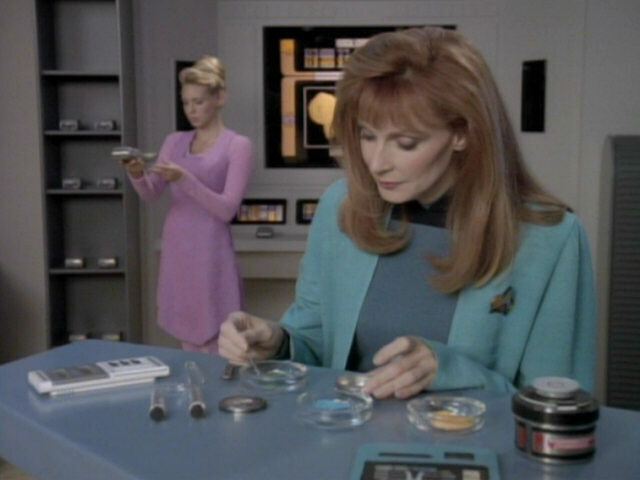 of Time" The Tagran lab in HD. 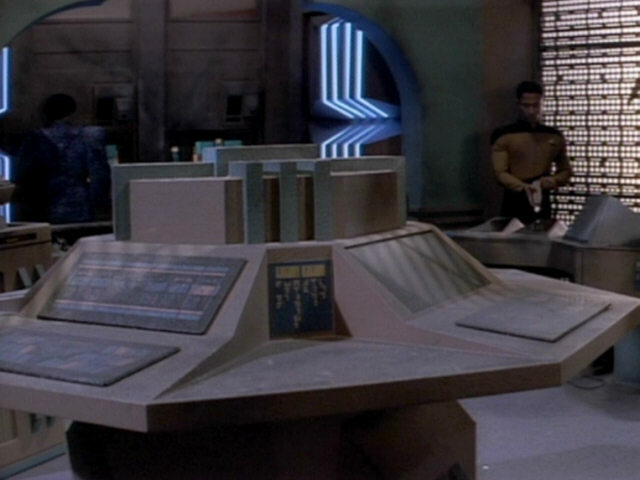 The Tagran wall console was originally created for the medical suite on Malcor III. 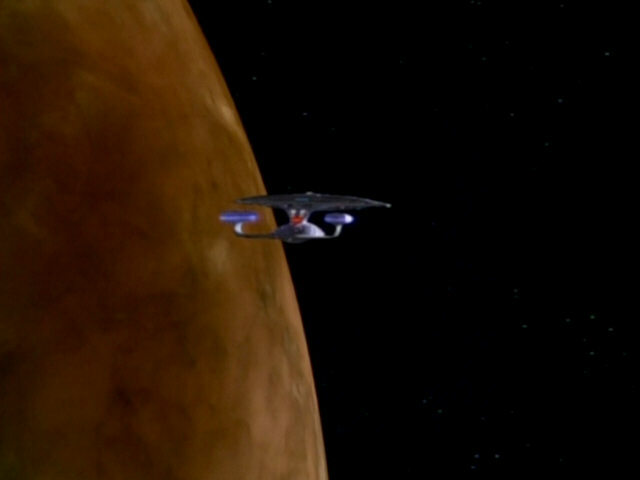 It last appeared in the engine room of the Romulan science ship in "The Next Phase". 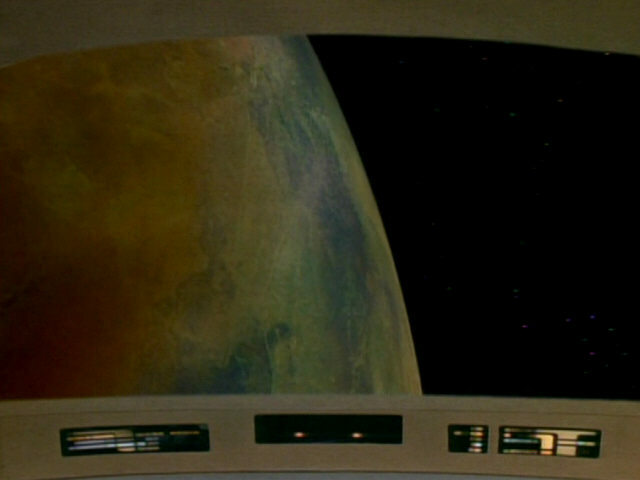 The atmosphere of Tagra IV is returned to its natural healthy state in this scene. 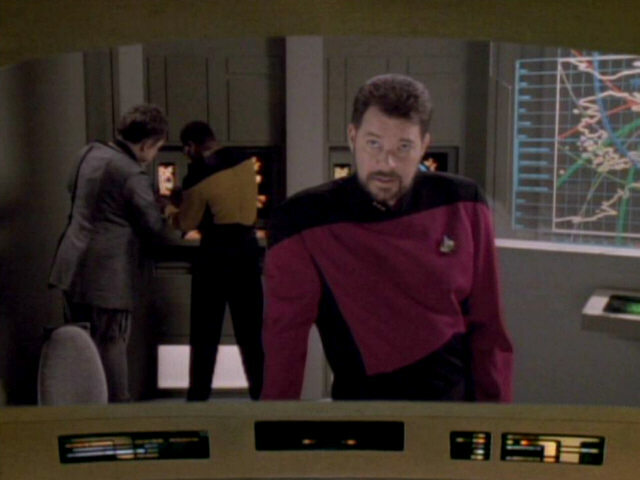 The reconstructed cleaning sequence. 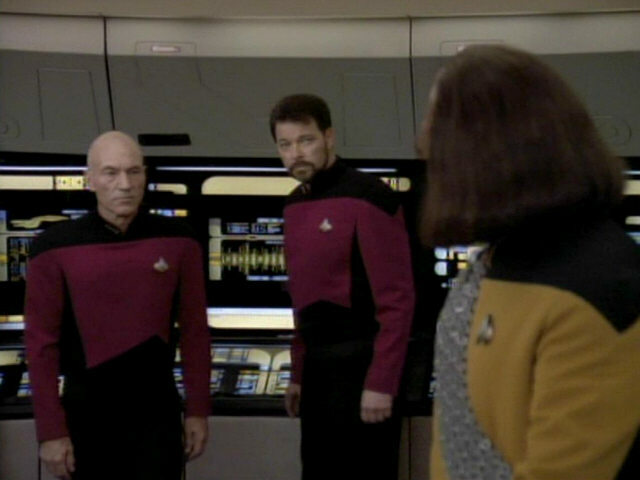 It looks more convincing in TNG-R.